On July 20, 1974, around 3,000 Turkish soldiers supported by artillery, armored carriers and two dozen tanks hit the beaches of northern Cyprus following a coup on the island by EOKA-B, an ultra-nationalist Greek paramilitary organization which espoused the enosis ideology of uniting all Greeks under a single state. The Greek-Cypriots were outmatched by the Turkish juggernaut. Five hours before the landings, two Greek-Cypriot torpedo boats raced toward the Turkish invasion force to little avail. Turkish warships riddled the boats with gunfire, sinking both. By August, Turkey had seized 36 percent of Cyprus’ territory, later setting up a puppet regime which exists to this day. In the aftermath, Greece’s military junta—which had assisted EOKA-B—was concerned about Turkey using naval power to expand its territory in the Aegean Sea at Greece’s expense. 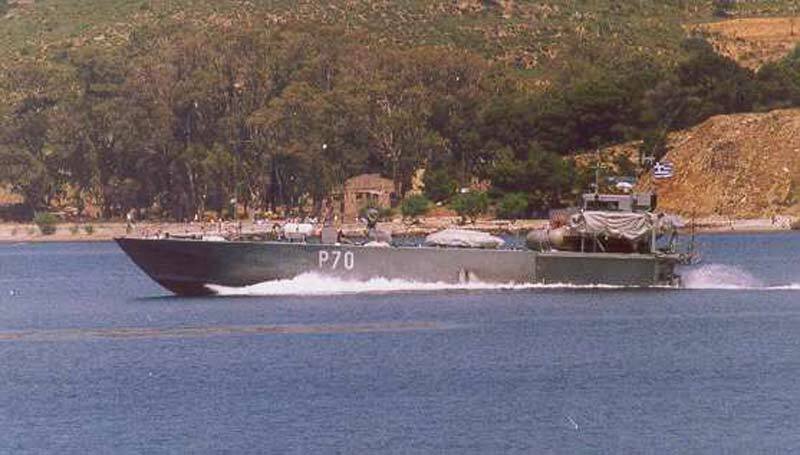 That was the genesis of the 35-ton, 23-meter-long Panagopoulos-class fast-attack boat—a highly unusual vessel. 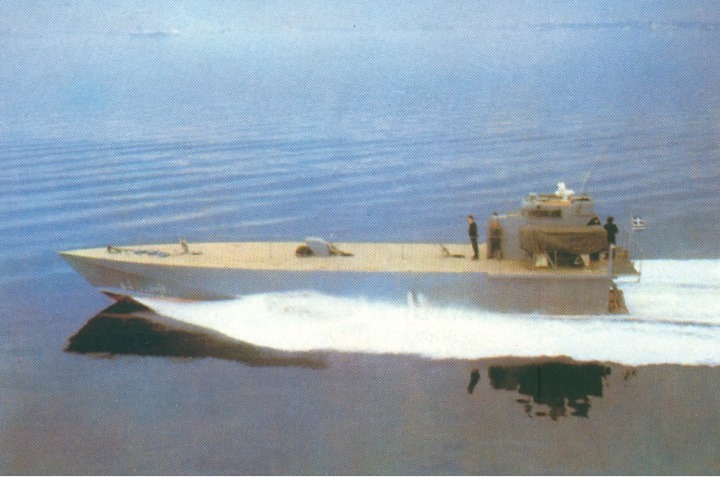 In 1974, naval reservist and engineer Eugene Panagopoulos designed the slender boats to race toward larger Turkish warships at a speedy 38 knots, getting extremely close—below the minimum engagement range of a foe’s larger cannons—and pummeling their sterns with an impressively fierce armament. Specifically—they each had a dozen 106-millimeter M-40 recoilless rifles in two arrays of six cannons each. It’s easy to miss these weapons when looking at photographs, as they were mounted toward the rear on each side of the bridge. The M-40 is an American-made anti-tank weapon developed in the 1950s and exported widely around the world. Recoilless rifles on go-fast gunboats are not unusual. A dozen of them in such a configuration is odd, indeed. The Naval Analyses blog, which dug up some interesting photographs of the vessels, noted that the Greek navy obtained three of them in 1975. The first served until 1991 and the remaining two were decommissioned in 2003 and eventually sold in 2015. Greece never used the boats in action—but almost did. In December 1995, a Turkish cargo vessel ran aground in disputed waters near the Greek island of Kalolimnos. While less than four miles from the Turkish coast, the vessel was closer to Kalolimnos, and the skipper allowed a Greek ship to tow his stranded vessel home. This precipitated a full-blown crisis. By the end of January, leaked diplomatic exchanges over what Turkey viewed as a Greek territorial violation set of a cycle of escalation fueled by nationalist media outlets on both sides. The mayor of Kalymnos, another nearby Greek island, raised the national flag on Kalolimnos—which provoked a Turkish news crew to fly in aboard a helicopter and take it down. Panagopoulos II and Panagopoulos III sped to the scene, arrived on Jan. 28 and raised the Greek flag on Kalolimnos again. Both sides began massing their forces but cooler heads prevailed. One account from the crisis has is that the heavily-armed gunboats engaged in a standoff on the night of Jan. 30-31 with the Turkish frigate F-240 Yavuz, which was outflanked. Yavuz‘s crew, unable to respond to the gunboats on their stern, then spent “several hours in agony,” the Greek military site Militaire stated.